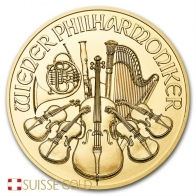 Austrian Philharmonic 1/10th Ounce Gold Bullion Coin. Each 1/10 Oz Gold Austrian Philharmonic coin contains 1/10 Oz of 99.99% pure investment grade gold bullion. 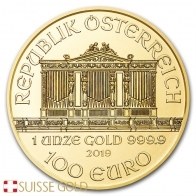 The Austrian Philharmonic gold coin is produced by the Austrian Mint, and the series comes in 1/10 oz, 1/4 oz, 1/2 oz and 1 oz sizes. The Philharmonic series of coins is also produced in silver and in platinum in 1 ounce sizes. 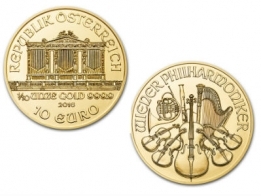 The 1/10 Oz Gold Philharmonic coin features and image of the Pipe Organ from the world famous Vienna Concert hall. The reverse side of the coin features a composite of images of of instruments used in the Vienna Philharmonic's orchestra. Each coin has a face value of €10. The Austrian Mint also sell a series of gold bars, in addition to the Ducat gold coin series. The coins are supplied in a plastic slip.